Paraffin and mineral oil immersion used in combination for the treatment of the distal parts of the body like hands and feet. It usually 6:1 or 7:1 of wax to mineral oil that used for therapeutic purpose. 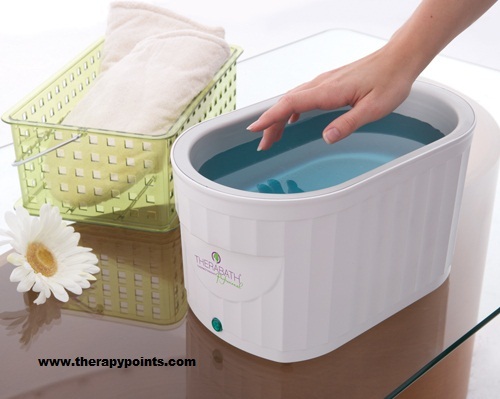 Paraffin wax therapy utilized for centuries for the treatment of many conditions. History of its use can trace back to the century of the Roman Empire. After that, the Roman physicians used it for therapeutic purposes. They use to pour hot wax onto the body of paraffin to patients in order to prepare them for the massage therapy. Later, the French started using Paraffin wax for the treatment of the injuries in order to increase the rate of healing for their patients and soldiers. During World War 1, the British Medical Soldiers also use warm molten paraffin as wax therapy for the treatment of the orthopedic injuries and disorders within the military hospitals. Wax usually melts at 54 c but when paraffin wax bath is added to this solution, this point lowers between 42 and 52 c making it more tolerable than hot water. In addition, the specific moist heat of paraffin wax bath lower than water and addition of paraffin lowers it further. The temperature of the paraffin wax bath usually maintained at 40-44 c. When wax solidifies, it releases latent heat of fusion (35KJ/Kg) that mode of transmission into body tissues and is responsible for treating different conditions of hands and feet. Higher temperatures beneficial for hands and lower for feet. Many Modalities uses their different kinds of energies and working principals. The most common method of wax therapy knew as the dip method. Some steps for that as follow. Wash the hands and feet of the patient and dip into the wax. After that remove hands and feet from the wax and leave it for 2-3 seconds. Again dip hands and feet into the wax. Repeat this process for 6-12 times. It makes a thick layer of wax on the hands and feet. Wrap the hands and feet in a plastic bag to provide heat and covered them in a towel. A layer of wax leaves the place after 10-15 minutes. After 15 minutes leave the towel. Used wax can utilize again for next bathing. Wash the part to treated, and ask the patient to immerse hand or feet in the wax unit. Re immerses the part to treated and then leave it in the unit without moving that part. Make sure that the patient positioned properly and comfortable during the session. Remain there for about 15 min, this can combine with active movements during the session. In this method, the wax molten, after which this wax poured means of a utensil on the part to treated and then wrap the part means of a towel. In this method, applied means of a brush over the part to treated. Several layers applied. Allow wax to become solid and then wrap it in a towel. In this method, dip the towel or bandage in the molten wax and then wrap it around the part to treated. This method useful for the treatment of the proximal parts of the body. a local melting rise in the temperature. Stimulation of vessels resulting in local hyperemia and reflex vasodilatation. Sedative effect on sensory nerves. Skin becomes pliable and moist. Degenerative diseases affecting hands and feet. Avoid following the ‘Dip and Re-immerse’ method. Use cooler wax temperature while treating foot than treating the hand.